If you’re looking to improve the look of your landscape design on Long Island, L.I. Elite Lawncare is always able to help with our services and products, but sometimes we encounter grounds that require more than just a little tender loving care. There are times when we are going to recommend a full-scale renovation be done for your home or business. L.I. Elite Lawncare does residential and commercial lawn care renovations throughout Long Island and we can restore your grounds and make them look like new. A renovation involves land clearing, which means taking out all of the existing grass and bushes on your property and replacing it. The best time to do a lawn renovation is during the spring between March and June. Autumn is also an ideal time from September until the end of the year. You likely need a renovation if your lawn is being overrun by weeds and crabgrass. That’s usually an indication that your lawn isn’t healthy. A healthier lawn will enhance the property’s curb appeal and boost your home’s value. It also gives you a chance to make your grounds look spectacular. L.I. Elite Lawncare often recommends installing sod when we do a renovation job. 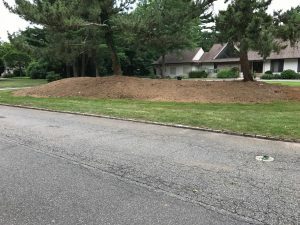 That’s because alternatives involving replacing the topsoil and seed can take up to a year and a half and there’s no guarantee that your new lawn will grow in completely, particularly if you’re working in the hot summer months. Sod will restore your grounds instantly and at L.I. Elite Lawncare, sod installation will cost you less than you might expect. We also have a sod laying machine that can do the job quickly. We can lay it during the summer months when you want to enjoy your lawn. If you have a lawn that’s seen better days and you want to get rid of the weeds and crabgrass and start anew, L.I. Elite Lawncare can help. Contact us today!